In an attempt to find Helen’s ancestors, I’m using DNA that I graciously obtained from four of Helen’s grandchildren (my father, two of his sisters, and their first cousin). Last week, I uncovered some possible clues that have raised more questions than I could have ever thought possible. And when DNA is involved, that’s really saying something! And then, instantly and without any such expectation, Edmond was an enormous person of interest! 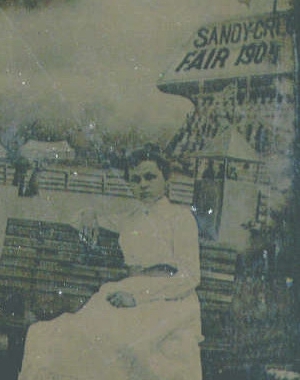 Edmond died in 1866 in New Haven, the very same small town where Helen’s mother was reported to have been born in 1869. And just a few miles from where my great-grandmother was born in 1889. Next I clicked on the SHARED MATCHES button to see all the predicted 4th cousins or closer that my aunt shares with R.T. (Note that AncestryDNA’s In Common With Tool only shows 4th cousins or closer; you can share many more distant matches with someone , but they won’t be identified by the tool). Two predicted 4th cousins that we’ll call Susanne and John. 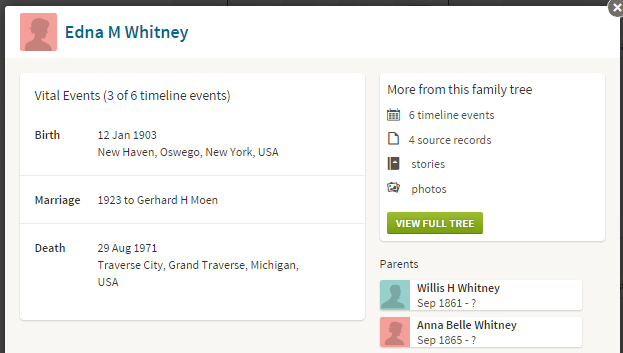 One of Susanne’s ancestors, Edna M. Whitney, was born in 1903 in New Haven. Yet another connection to the small town of New Haven, Oswego County, New York! I wanted to dig into this family quickly to see if I could tie it in any way to the Snell family. A quick internet search uncovered the wonderful Whitney Research Group, including a page describing the family of Burton C. Whitney of New Haven, who was the father of Willis Whitney (who married Anna Belle Daniels). To my shock, the wife of Burton C. Whitney was reported to be none other than Julia SNELL, daughter of “Edmond Cooley and Cynthia (Parmele) Snell.” Of course this would all have to be verified, but it was all quickly becoming a very tantalizing clue to my great-grandmother’s biological ancestry. Once again, Edmond Snell was in the family tree of this cousin! (As you’ll see, although this Mary Elizabeth Snell is the same Mary Elizabeth Snell found in R.T.’s tree, they’re descended through different daughters of Mary Elizabeth Snell, and the accounts appear to be administered by different people). I had been using my aunt’s results, so I went to my father’s account and checked to see if he had all the same results (and potentially some additional ones). He did indeed have the same results, the only difference being that he was actually a predicted 3rd cousin to R.T. where my aunt was a 4th cousin. Then I searched for SNELL in the match list of both my aunt and my father. Since AncestryDNA’s In Common With only shows predicted 4th cousins or closer, it was possible that there were other SNELL relatives from the same close family that didn’t share enough DNA to be 4th cousins or closer, but who still might be able to add to this research. Again a little beginning research, and I discovered that Sylvester Snell (reported to be born in Paris, Oneida County, New York in 1805) was reported to be the brother of Edmond Snell (possibly born in Paris, Oneida County, New York in 1802). 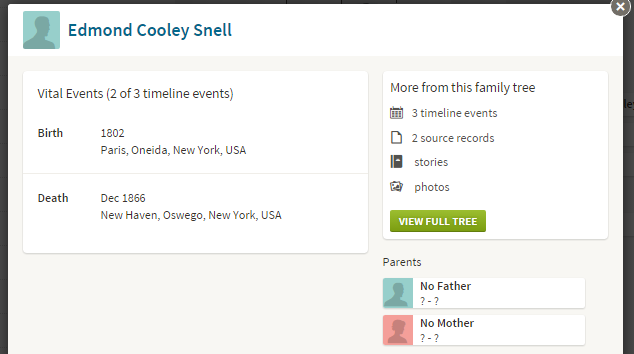 Could Helen Johnson be a Descendant of Edmond Cooley SNELL? Of these, the descendants of Edmond Cooley Snell (R.T., Susanne, and John) were shared by both my father and my aunt, and were 3rd to 4th cousins (we’ll look at the amount of shared DNA in the next post). Meanwhile, the descendant of Sylvester Snell (Jacob) was only shared with my aunt and it was a much more distant relationship. This pattern – together with the amounts of DNA shared by these relatives – make me think that it is very likely that my father and my aunt are descendants of Edmond Cooley Snell, and quite possibly through their grandmother Helen Johnson. Unfortunately, concluding that Helen Johnson was a SNELL descendant would be an enormous leap here, for several reasons. First, it is still possible that R.T., Susanne, John, and Jacob are related to my father and his sister via an entirely different family and surname that the paper trail hasn’t yet uncovered. Second, there isn’t any real evidence that these individuals are related to my father and his sister via their paternal grandmother. There are 3 other grandparents through whom they could share this relationship. There is something, an undeniable fact that I haven’t yet revealed. This undeniable fact makes the SNELL family extremely tempting as Helen’s biological family, yet at the same time calls the entire delicate hypothesis into question. On April 9, 1932, Helen – a very recent widow at the age of 43 – married Walter A. Snell, grandson of Edmond Cooley Snell.